Abstract: Bloomberg is reporting that Noble Bank, which back in February 2018 we speculated could be Tether’s primary reserve bank, may be facing financial difficulties. 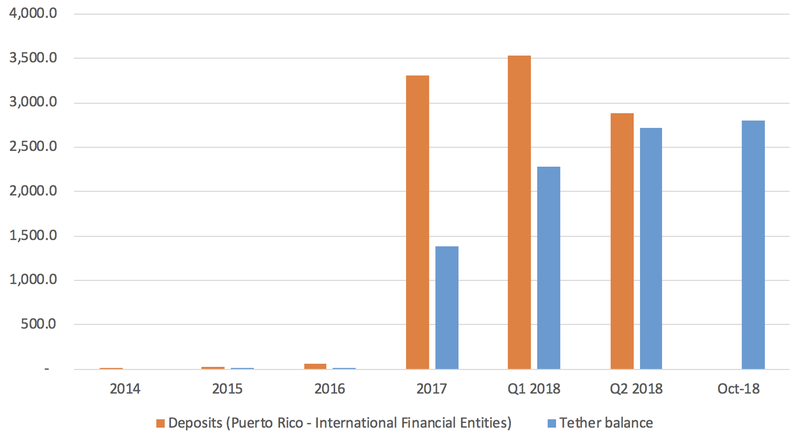 Tether is said to be diversifying away to other banks and this hypothesis is supported by Q2 financial data from Puerto Rico. Bank deposits in the International Financial Entities (IFE) category, which includes Noble Bank, were $2.9 billion, down 18.4% in the quarter. This is despite continuing growth of Tether, which is illustrated in the below chart. In our view, this data supports the assertion that Tether is moving its reserves out of Noble and into other banks outside of Puerto Rico. BitMEX Research has also been informed by Tether insiders that the Tether funds have been diversified into other banks. Puerto Rico has seen a surge of cash related to cryptocurrencies. By the end of 2017, cash and equivalents held by so-called international financial entities, such as Noble, soared to $3.3 billion from $191 million a year earlier, according to data from Puerto Rico’s bank regulator. As of June 30 this year, the total had dropped to $2.6 billion. The majority of that money on the island was held by Noble, people familiar with the matter said earlier this year. Bloomberg is also reporting that Bank of New York Mellon is no longer Noble’s custody bank. Tether’s hunt for more reserve banks continues.